In a Turandot performance, there is no missing Puccini’s enthusiastic use of percussion—particularly the gongs—to evoke the atmosphere of his Chinese fairy-tale kingdom. 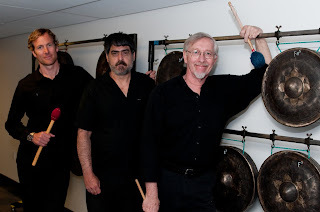 So for this issue’s Staff Chat, we spoke with three members of Seattle Symphony’s percussion section: the section’s principal, Michael Werner; Ron Johnson; and Michael Clark. Each spoke about the challenges of percussion and of the pleasures of playing for an orchestra that involves both the symphonic and opera repertoire. Turandot’s percussion section is robust (and busy). By comparison, Madama Butterflycalls for three players who play at the same time for about five minutes. In Turandot, five percussionists play together for about half the opera. The instruments are as varied as the gongs and snare drums, chimes and a tam-tam. The players will be arranging 12 tuned gongs on racks, running backstage to play in the banda, and performing a technically challenging four- mallet glockenspiel part. Playing in the percussion section involves a number of unique challenges. First there is the problem of space, the sheer number of instruments that need to fit in the pit, with enough room for the percussionists to maneuver around each other and the instruments. Moving from one instrument to the next without bumping into one another requires a level of athleti­cism and teamwork unique to their section of the orchestra. Composers sometimes also throw percus­sionists the additional curveball of includ­ing an instrument the musicians have never heard of before, or the occasional special effect. Sometimes an instrument isn’t avail­able and the section has to find a way to make the same sound called for in the score. For instance, Puccini created a part for a bass xylophone, an instrument that was unavailable, so Michael Clark will play the part on marimba instead. Clark, also a Seattle native, remembers needing a ride from his father to get his union card when he first started with the orchestra at age 15. He joined the orchestra full time in 1991. In addition to the marimba, he’ll be playing the tam-tam, crash cymbals, and triangle, though his favorite Turandot sounds come from the bass drum. “The bass drum notes in Turandot make you feel like you wrapped yourself in a warm blanket,” he says. This Staff Chat first appeared in Seattle Opera’s program for Turandot in August 2012.